Axis Of Oversteer: Axis of Power: Porsche 997 GT2 vs Ferrari F430 Scuderia Track Test. Axis of Power: Porsche 997 GT2 vs Ferrari F430 Scuderia Track Test. Two of the best cars on the planet, a fantastic track, a couple of Traqmate data recorders and some cameras, we set out to produce the kind of comparison test we would love to read more of. The idea is to be as transparent as possible so we would like to encourage you to download the data files and the free software to read it. The more we looked at the data, the longer this article became. It's great to be able to analyze performance, give it a try, maybe you can pick up something we missed. It's a lot of reading, I hope you enjoy it as much as we did putting it together. Hopefully we'll get to do more in the future! 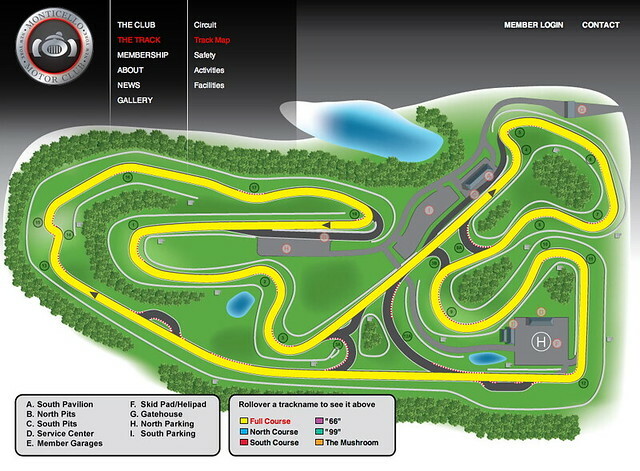 Monticello Motor Club is a challenging track with very technical, demanding corners. It needs a very well handling car to be enjoyed but also allows the opportunity to to open up the big guns of power and reach speeds of 160mph on its very long back straight before hitting the brakes hard for a Laguna Seca, or perhaps more like Thunderhill, style 45mph corkscrew. This in full view and with appreciation for, a very close tree line beyond a short sand trap. It gets your attention. There are many 2nd gear corner exits where judicious throttle application on 500hp cars on street rubber is a must. Both the Porsche 997 GT2 and the Ferrari F430 Scuderia are bone stock riding on the same tires that came from the factory and using the same brake pads. So the same exact tires mind you, the GT2 shows 23000 miles on the clock and is now on its 5th set of Michelin Pilot Sport Cups (what can I say, other than grin?). The Scuderia’s Pirelli PZero Corsa were replaced just before I bought the car at 3500miles, that was 3000 miles ago. So tires have roughly the same life and , as I found out later, not yet totally heat cycled out. Both cars are equipped standard with ceramic brakes which don’t fade at all, the sandard “street” pads work great at the track. Both Porsche and Ferrari offer “race” pads for their CCB’s but those are only necessary if you are racing, 20+ laps at race pace. For a occasional track day they will just wear out the rotors faster, not a good thing at $5000 per corner! I ran both cars with all driver aides turned off. No matter what you read on internet forums, driver aides on street cars cut performance and power as they work for safety, not designed as performance enhancement like on the old F1 cars (Ed. note This may have changed on the new Ferrari 458). All systems off, in addition to being faster and allow to truly get 10/10ths out of the car, it’s also more fun! I wish we could have had the time to do laps with driver aides on and off to show with the Traqmate data how much lower the HP (calculated based on weight, Gs, speed and other factors) is on corner exit. Decided to go first in the GT2 as it certainly requires a sense and sensitivity retune given that its power limit is not as linearly approachable as in the naturally aspirated Ferrari. I feared I might just kill myself in the GT2 if I jump right after getting comfortable with the Ferrari’s linear throttle. 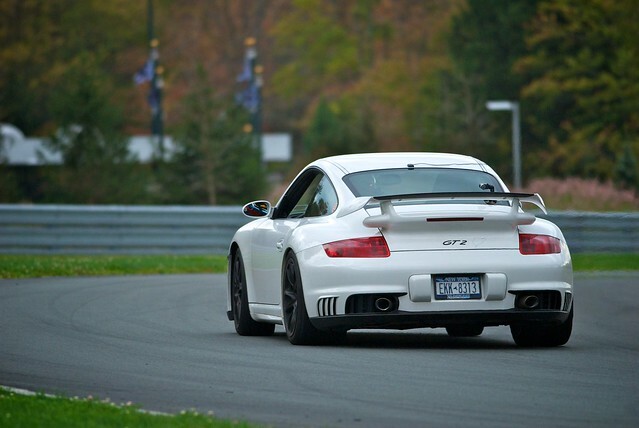 The GT2 is extremely approachable at 9/10ths and a lot more fun/and faster than a GT3. It shares the same geometry with a GT3RS but shocks are better tuned. Extracting that last 10th is what makes it a great driver’s challenge, given the immense torque and brutal nature of Turbo cars (with only RWD). Oh my god Is this thing fast!! Not having driven it that much lately just means the impact of the turbo power surge feels more insane. It is such an expression of effortless performance. No big revs, no big noise, but you just feel your back stamped to the seat and watch the digital speedo creeping up to unbelievable numbers. The power gap to the Scuderia feels like 100bhp instead of just 20bhp. I can barely go full throttle anywhere on the first lap on cold tires and the landscape just moves too fast on the back straight making me brake a lot earlier than what I should. Even after a cautious approach on the first 2 laps to warm up the tires, it becomes oversteering mayhem. Quick pitstop confirms 38psi in the rear: 4 psi too high. This car clearly depends on its rear tires mostly. Bleed down and ready to go. I post some decent lap times but not yet the ultimate pace. Several controlled oversteering slide exits help build up the confidence and the Porsche brakes are the best in the business allowing confidence for as late and as sanely advisable braking points. Ready for the next session. Started pushing more and more and traffic became an issue, the GT2 is so fast that on such a Iong track, 500yds is sometimes not enough space to allow the car in front before a hot lap and not finding myself catching it mid corner somewhere. The big Porsche is hard to dance with on the limit, power on exit and once you have exceeded the rear grip you just cannot micro adjust the throttle back. Backing off the throttle, even slightly, means the boost falls off and a massive tank slapper awaits, so your only choice is to keep the throttle pinned and ride the power slide with very fast and confident opposite lock. Short shifting is mandatory in some places with the PSC tires as 2nd gear puts too much torque to the ground. On Hoosiers it can hold up full throttle at many more places. After 23Kmiles I think the LSD might be not at its best as the car is a bit more twitchy under braking and the inside rear doesn’t feel as locking up that much under power on corner exit. Steering is precise and confident but you need to make sure the front is weighed before turning in, then the car just needs to be set on its rear tires and make sure you are unwinding lock once you start to put the exit power down. Applying massive throttle without unwinding will make it understeer first as the nose loses weight, then it will be massive oversteer if you keep it pinched. No serious scary moments and sort of a clean lap in the 2:33s, 1sec+ better than what I did in the summer heat but still 2.5secs off my best time on Hoosiers. I was going for another hot lap after cooling things down, but some loud resonance noise started coming out from the rear. Checked in the pits and we had very little rear pads left; it is not advisable to wear the CCB pads fully as they can compromise the rotors. 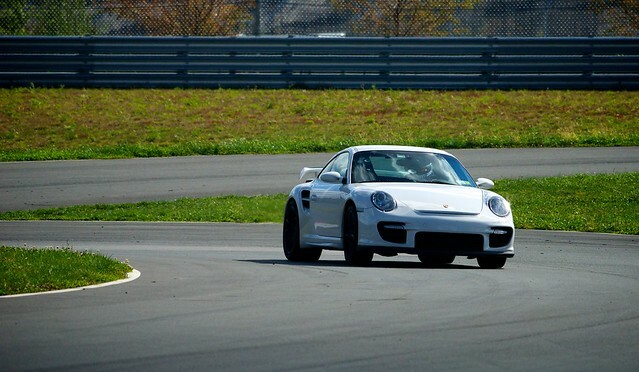 Not worth it to lose precious track time swapping pads but 0.5sec better lap could have been possible in the Porsche. The GT2 is really an awesome machine, but not for the faint of heart and 10/10ths is really a knife’s edge. It is definitively a much bigger challenge and a lot more risk tracking with the GT2 than a highly linearly predictable GT3, which is significantly slower. Time to jump to the Scud. First impression sitting in the Scud coming from the GT2 is how much lower the seating position is, it truly feels racecar low. Full throttle out of pits and the power is so linear you feel the performance envelope is easier to approach. Steering is lighter but you can feel all the road and what the car wants to do. Gear changes are the best thing on this car. The GT2‘s box feels so dated compared to this paddle shifter. Close ratios, immediate gear changes anywhere through a turn, plus the ability to left foot brake ALL the time, make the Ferrari drivetrain the best in the business. Why the need for heavier Double Clutch gearboxes? This is already almost perfection (DCTs solve just the problem of working properly as an automatic, which I don’t really care for). Two laps to get reacquainted and get pressures right and one can clearly tell this car works the front tires a lot harder. 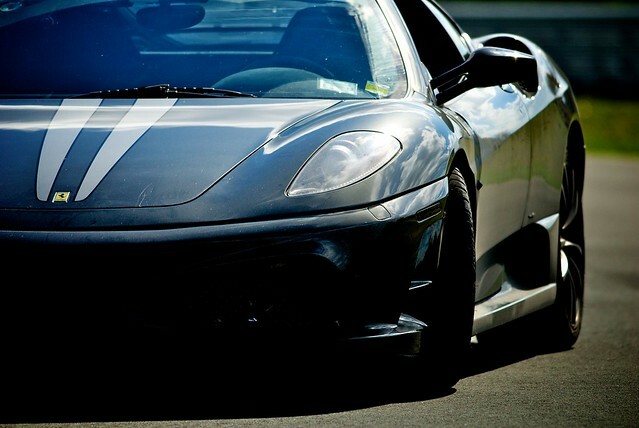 The Scud could benefit from wider front rubber and adjustable swaybars. MMC requires a tail happy setup, which I could only dial in the GT2 by stiffening the rear bar. Good thing the Scud is an eager turning in machine so I was able to manage the slight push, but that meant only doing one hotlap at a time not to overcook the front tires. Rear grip on corner exit can be managed to perfection thanks to the best throttle response on any car and the amazing LSD that still does what is supposed to do with all aids off. I wish I could have that differential in all the cars I own from now and forever in the future, including racecars. 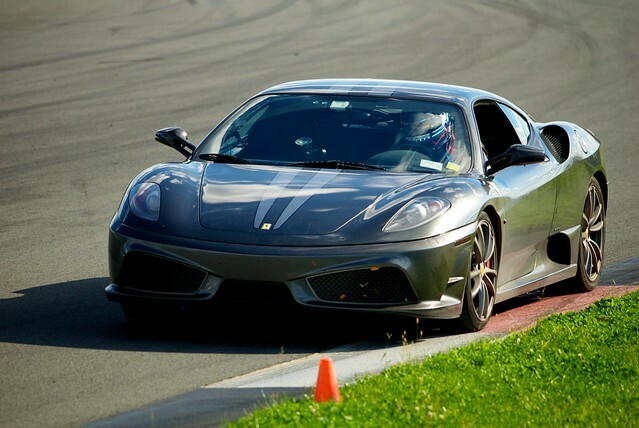 Its hard not to get biased just by the experience of driving the Scud. The noise is really music. It even sounds great on video, so just imagine how truly great it is on real life. All the controls in the car: steering, throttle, gearbox and brakes allow you to place the car wherever you want it with the attitude you need (over/under steering, etc.). Only the brakes feel inferior to the GT2’s. For some reason the Porsche’s have more initial bite as well as more feel at the limit while the Ferrari’s require increasing pressure on those big brake zones, up to the point it feels like a huge work out and you are putting more than your body’s weight on that left pedal praying for it to slow down. Telemetry should show shorter stopping distances for the GT2. Some traffic on that first session and the Scud was almost a full second down on the GT2. I had worked the front tires too hard so decided to stop, cool things down and then go for the ultimate flyer. Started the next session by gently having the tires come to the right pressure, made sure traffic is far enough ahead, and went for it. With that diff it’s tempting to play Dorifto master on every corner, I tried to keep things clean but did put ALL the power down on exit correcting when needed. The Scud doesn’t lose a bit of forward thrust under mild opposite lock. Had a nice clean line through the tight stuff and then braked as late as I could on the back straight, so much so that the car was all over the place and ended entering the corkscrew from the middle of the track (instead of the edge). Not much time lost there, maybe just 1/10th as you still have plenty to slow down turning right up the hill. The traqmate reveals how good the lap was: 2:32! ; more than a second faster than the GT2! This car feels too good to be just a streetcar. Whomever says that once you drive racecars you don’t want to drive any street car at the track is wrong. Both these cars are so much fun, and you can push them hard and have fun at the track. I even like that the tires are not as grippy and that you can use more slip angle. I think the RComps like the Sport Cups are pointless as they cant take any standing water, while the Ferrari’s Corsas, although less grippy, have decent water channels. Drove 300mi last week down to Summit Point in monsoon weather with no issues in the Scud. Checking the telemetry and best sector times (feasible sectors that can be truly achieved independently) reveals the laptime difference favours the Scud by about 1 second, despite the GT2 being slightly faster on straightline acceleration and later brake points. MMC has a lot of long corners that prove and advantage to the better handling Ferrari and more neutral midengine layout. Had it been more 90 degree fast corners like The Glen, I think the slight advantage will be to the GT2. Check the charts below (Blue Scud, Red GT2). The second graph is how the Time Gap develops (lap starts on back straight). Notice how the GT2 loses on the continuos corners but then creeps time back under acceleration from the slower stuff. In high speed acceleration the Scuderia doesn't lose ANY time between gears and its ratios are closer (less difference in the rate of speed increases). On the lower chart, is the calculated Turn radius. The higher spikes in Red mean the GT2 moves laterally a LOT more, mostly under braking but also on corner exit (corrections). So our test reveals that our outcome is in-line with EVO and Top Gear Tracks tests. 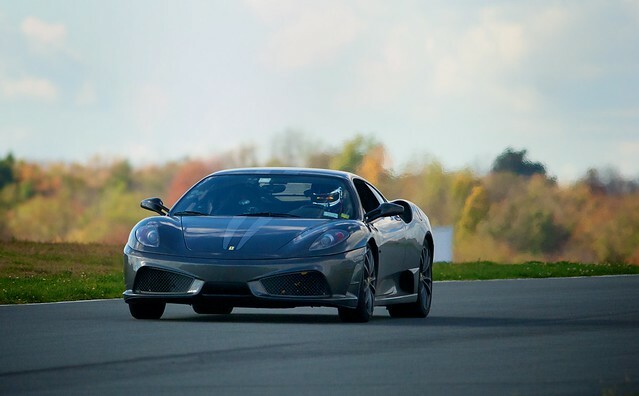 Both cars are almost equally fast, with a slight edge to the Scud; but on seat of the pants experience and emotions the 430 Scuderia can really be the best Track car (OEM street legal) in the World. 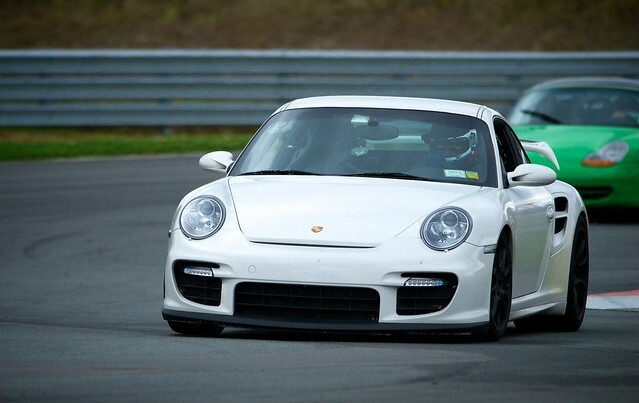 Nevertheless, if you can afford it and are up to the Challenge, get a GT2 anyday over the GT3 (and race a Cup Car for that N/A Porsche experience). Mcpherson struts front, Multi Link rear, Adjustable shocks. Adjustable anti roll bar. Double Wishbone all around, adjustable shocks, fixed anti roll bar. Michelin Pilot Sport Cup "N"
Suspension never bottoms out, and despite stiff springs and bars, the shocks can take almost anything and keep the wheels at grip. The Nurburgring masters at work More supple ride than the GT2 and provides good control, but eventually the suspension can bottom out and “pogo-stick” you off-line if you are too aggressive. Typical Porsche clean and efficient interior, same as every other Porsche. Fantastic seats. Nav system is as unintuitive as an old iDrive. Great seating position, Lots of carbon fiber, Paddle shifters are perfection but ergonomic nightmare for all else. Hard to read dash with cartoonish labelling but, nobody cares! So what if you can't turn on the radio? Like a giant vacuum cleaner from Hell Sound? you mean music...there is nothing better. Efficient, brutal axe murderer masquerading as a mild mannered athlete Will steal your heart and wallet and leave you on your knees begging for another date. I enjoyed the writeup and videos. thank you. I guessed the GT2 time dead on, missed the scuderia by 6/10's not bad for. @Will haha, we were guessing you had access to the MMC car transponder feed! fantastic stuff! very thorough and well written/executed. @Constantine I would love to test a GT-R because I still cannot believe it's as fast as everyone says. Testing a 458 vs the Scud would be awesome. My Mcoupe vs the upcoming 1 series M.
@AC I'll take you up on that sticker offer. I have a GT-R and I can assure you it will do a 2:33 or faster around monticello. I might be going to NJMSP end of this month any chance you'll be there. Really, really nice thorough review. I would love to see more of this in depth stuff. This is better stuff then lot of "professional" reviews, where its just some numbers you can get of any site. @Will, the GTR is in my ToDo list of Cars I will like to try. It just doesnt make any sense on paper that it is so fast at the track, but all tests have posted similar laptimes to GT2 and Scud. - M3 vs Mercedes S63 AMG? Note, I had a typo in one of the tables caught by one of out eagle eyed readers! I added a more realistic "sustained" lateral G figure to the data. This was a fantastic writeup, thanks very much! @AC I saw that too where it said the GT2 hit 1.97, and I thought wow that's a pretty big spike for a street car. 458 v. Scud should be great, it's always good to look how much technology could help in tracks. And it'll be one great orchestra of music too. Thanks for the review on the P Zero Corsa system!